As we continue through October, we have come to the end of the summer season and are beginning the fall one. 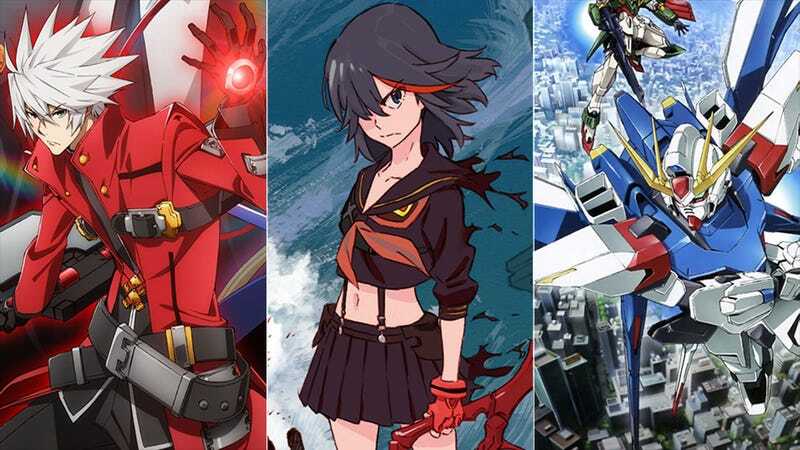 But with 49 new anime in the pipeline, how do you know which ones to watch? Check out the trailers and brief blurbs about each to see which of them catches your interest. What It’s About in One Sentence: A sophomore boy with a healing factor befriends a girl who can blood-bend. What It’s About in One Sentence: A boy who lives on land befriends four kids who live at the bottom of the ocean. What It’s About in One Sentence: A young girl and her two brothers find themselves trapped in a fantasy world filled with yokkai as they hunt for an atypical rabbit that holds the key to them returning home. What It’s About in One Sentence: The adventures of a shrine maiden and a fox spirit acting as go-betweens for humans and the gods. What It’s About in One Sentence: Despite coming from a family of mystics, this high schooler has been living a normal life—until the day his childhood friend shows up and pulls him into the mystical world hidden within our own. What It’s About in One Sentence: In an alternate 20th century where scientists were able to create magic living doll weapons, a boy and his doll must fight his classmates to become the king of his school. What It’s About in One Sentence: Four superpowered teens police a town that is home to both humans and demons. What It’s About in One Sentence: An apprentice shaman hunts the world's strongest vampire in modern Japan. What It’s About in One Sentence: The sequel to last fall’s Magi: The Labyrinth of Magic, this anime continues the One Thousand and One Nights-inspired adventures of Alibaba and Aladdin in their Arabian fantasy world. What It’s About in One Sentence: After having to quit his own knight training because of an injury, a young man decides to become an assistant to a maiden knight in training instead. What It’s About in One Sentence: A former hero-in-training (former because the Demon King has already been defeated) finds himself working at a magic shop alongside the deceased Demon King's daughter. What It’s About in One Sentence: Transported to a fantasy world, a young otaku becomes a “moé missionary,” spreading his love of moé throughout this strange new land. What It’s About in One Sentence: Based on singer/voice actress Horie Yui’s virtual avatar, this micro-anime follows the titular Miss Monochrome—a virtual girl with a pet roomba—as she strives to become a top idol. What It’s About in One Sentence: This is the second season of a gag-based comedy about a young bug who goes to “biting school” so he can inherit his family’s “biting shop” business. What It’s About in One Sentence: The best hitman in Japan prides himself on being able to complete any assignment—even if that assignment is homework or housecleaning. What It’s About in One Sentence: A man decides to become a super hero all on his own despite having no super powers or special technology. What It’s About in One Sentence: This is a comedy about an eccentric older sister and younger brother pair who become friends with another eccentric older sister and younger brother pair. What It’s About in One Sentence: This is the third season of a micro-anime (each episode is about 2 minutes long) about the crazy lives of a high school girls tennis club. What It’s About in One Sentence: This is a CG anime about four girls and their afterschool club activities. What It’s About in One Sentence: Five bespectacled boys in a rural high school join a club for those who have a passion for glasses. What It’s About in One Sentence: This is the second season of an anime based on a visual novel about a group of five childhood friends enjoying high school life—though there is more to what's going on than meets the eye. What It’s About in One Sentence: A young girl moves from Tokyo out to the countryside and finds herself in a combined elementary/middle school that only has five students in all. What It’s About in One Sentence: This anime follows a high school boy who is occasionally presented with multiple-choice quizzes in his head that will alter reality based on his answers. What It’s About in One Sentence: A young man manages to get into one of Japan's top law schools only to find his childhood friend (read: stalker) has gotten into the college as well. What It’s About in One Sentence: After moving all alone to a new town, a girl with supernatural powers finds herself going to an elite high school that is only open at night—and living with six vampire brothers. What It’s About in One Sentence: When the man with the world's biggest bounty on his head surfaces, the strongest fighters in the world converge on this location to take him down and collect the bounty. What It’s About in One Sentence: Three girls, immune to radiation, are sent into the dead, radioactive ruins of Tokyo on a special mission. What It’s About in One Sentence: Based on the Capcom-made 3DS game of the same name, this anime follows a group of young men hunting down metallic monsters in the near future. What It’s About in One Sentence: Two alien sisters—who dream of being fashion designers—are accidentally transported through time and must collect eight mysterious Tamagotchis to return to their own time. What It’s About in One Sentence: Based on the popular collectible card game, this anime follows a young man battling for rare cards all across space alongside his talking animal sidekick (that farts a lot). What It’s About in One Sentence: This is the second season of an anime about the only male pilot of an Infinite Stratos exoskeleton suit. What It’s About in One Sentence: The second season of the anime Freezing where, in the future, earth has been invaded by aliens and it's up to a group of genetically engineered girls and their male partners to fight back against the alien menace. What It’s About in One Sentence: In a world where humanity has been driven from the seas by an unknown, AI controlled, technologically advanced fleet, a boy and his friends commandeer one of the ships and take to the seas. What It’s About in One Sentence: The second season of an anime about space vampires, body swapping, and giant robots. What It’s About in One Sentence: In a world where you can build your own custom Gundam model and then pilot it in a VR game, two middle school boys strive to become the best builders and fighters in the world. What It’s About in One Sentence: When 30,000 people are trapped inside a MMORPG, two real world friends and an assassin companion struggle to live in their new reality. What It’s About in One Sentence: Three sisters, descendants of Galileo, find themselves on the international most wanted list. What It’s About in One Sentence: From the team that brought you Gurren Lagann comes a completely over-the-top magical girl anime where a wandering transfer student hunting her father's killer comes to a school ruled by a tyrannical student council president. What It’s About in One Sentence: The third season of an anime following the career of one young boxer and his friends. What It’s About in One Sentence: The second season of an anime about a high school basketball team on the road to becoming the best. What It’s About in One Sentence: An ace pitcher joins a high school baseball team and together they strive for the national championship. What It’s About in One Sentence: A young otaku wanting to join the (recently disbanded) anime club at his school finds himself joining the cycling club instead. What It’s About in One Sentence: One day a popular idol suddenly decides to become a professional wrestler. What It’s About in One Sentence: Based on a collectible card game, this is the second season of an anime about a school where girls train to become pop idols. What It’s About in One Sentence: This is the third season of an anime about a high schooler who uses his amazing ability to solve puzzles to battle against a secret organization. What It’s About in One Sentence: With the release of a new game comes the corresponding anime about a boy who captures wild animals and forces them to fight for his sadistic pleasure against other captured animals.